For an island that has pretty consistent weather all year long, we've hit a heat wave where the temperature is over 90 and the humidity is over 90% as well. It's time to hole up in the shade, a cool room, or an even cooler movie theater. Here in Hawaii, a favorite addition to popcorn is arare, or rice crackers. Arare comes in all different shapes and flavors. Smuggling a bag into the theater to mix with your popcorn is just what some people do. I may have become some people. 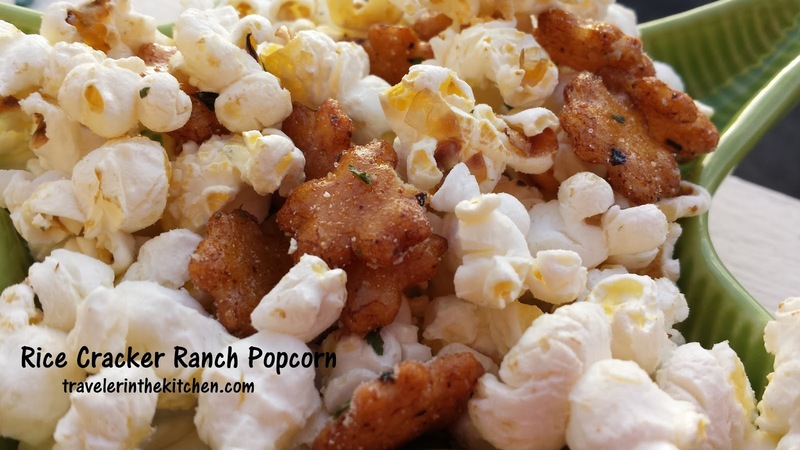 For movie night at home, just pop some corn, add some arare, and if you're feeling especially bold, kick it up with some ranch seasoning. Pop your popcorn however you'd like. When your popcorn is ready, add the arare. Drizzle the melted butter and toss to coat. Sprinkle the ranch dressing mix over the top and toss to coat again. Hide someplace cool and enjoy. Wondering what else would be good on Hawaiian-style popcorn? Try li hing mui powder or furikake (seaweed flakes). How to you dress up your popcorn? Another place to go in the heat is the Aquarium. 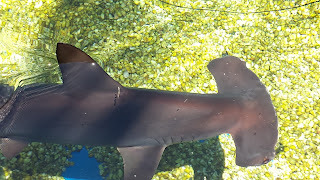 Hello hammerhead!